One of the biggest fitness raves, Insanity workout is a sure-shot program devised to give you the dream figure you have always dreamt of. Shaun T, the exceptional trainer behind Insanity workout, aims to give you Total-body conditioning in just 60 days by accelerating your fat burn and making you sweat! By taking on the high-intensity push and training through super-intense routines Insanity workout will keep the flow of blood at peak and rev up the metabolic rate without the use of single weight. The insanity workout reviews swear by the fact that it is going to give you truly insane results. In this insanity workout review, we are going to focus on the technique behind the results, tips to advance your fitness safely and other questions that you had about this amazing workout. Insanity workout uses the formula of “dig deep” and uses intense movements at higher speed to give you results in just two month’s time. The idea of MAX Interval Training is going to make you work through higher reps to lower ones to keep your muscles and mind occupied, thus advancing fitness and reducing the boredom factor. Shaun T mimics the Insanity workouts users by saying, “Push through! Dig with me, I’m right here!”. The workout is based on 10 core high-intensity routines that uses high-intensity intervals combined with short periods of moderate exercise. Insanity workout bills itself as the hardest workout that utilizes just the body weight to get results. The use of Max Interval Training Technique will kick away the fitness plateaus and maximize the fat burning process hours even after you are done with the workout. It will include core cardio, resistance, plyometrics, and max interval circuit training methods combined with advanced moves and stretches. 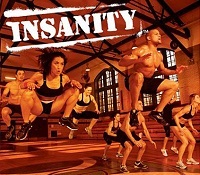 In just one hour of training with Insanity workout, you are going to burn around 1000 calories. So if you are ready to take on intense workout regime to get in the best physique and advance muscle development then jump into Insanity and get your body totally ripped in just 60 days. Another thing to note is that the intense routines are not recommended for those who have weak joints, suffer from muscle injuries, old, pregnant, or are new to fitness. 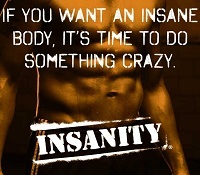 Take on the Insanity workout “Fit Test” to ensure that your body is suitable for doing the workout. Proper warm up and cool down workout is necessary for losing up the muscles and avoiding injuries. Modify the routines to suit your physical capability with the help of Insanity workout modifier to avoid the aches. Insanity workout program indeed gives what it claims in just 60 days, relying solely on body-weight exercises combined with high-intensity interval training technique. Make sure you follow proper techniques and push-play Insanity workout to reach your goals!